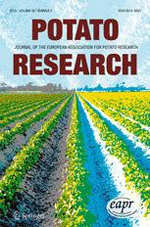 The European Association for Potato Research (EAPR) aims to to promote the exchange of scientific and technical information relating to all facets of potato breeding, production & protection, storage & utilisation between various countries, both in and outside Europe.We seek to encourage and assist international co-operation in this field. EAPR Members - please update your password here and check your address details are correct & up-to-date. We hope you like the new site - your feedback is welcome here. Reports of students from Breeding and Varietal Assessment Section Meeting 2018 are available now in the Section's Resources.